I seem to be following a trail. First there were the petroglyphs in Colorado, then some aboriginal paintings in Kakadu and at the start of this month, I visited Carnarvon Gorge National Park in Central Queensland and saw some rock art. 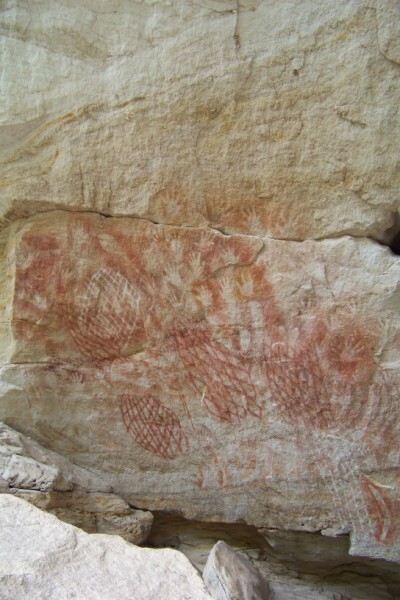 The paintings were not as refined as that in Kakadu and comprised of a mainly stencilled patterns where ochres were sprayed over an object. There were a lot of hands but also nets, boomerangs and other objects. In addition there were some carved symbols. There are three sites there. One of which required a 20 km hike. I am fitter than I thought. 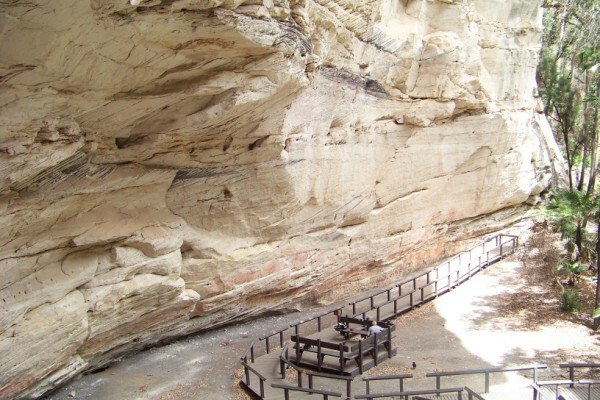 The viewing platform at Cathedral cave allows access to the aboriginal art along the base of this rock wall. All of these images have been created by ochres being sprayed over an object: hands, boomerangs and between two fingers for the fish nets. There were a group of 6 textile artists on this adventure, with two husbands: Sandy Webster (USA), Mary Crehan (Ireland), Fay and Mike Roselt, Glenys and Robert Mann, Truda Newman and myself. We all did our own thing during the day, meeting for a communal meal at night, sharing our stories and what we had seen or done during the day. Accommodation at Takarakka, www.takaru.com.au was in safari style tents, very comfortable but a bit scary in a wind storm that followed a day of rain. One does become very aware of the force of nature when bits of trees are bombarding the tent. 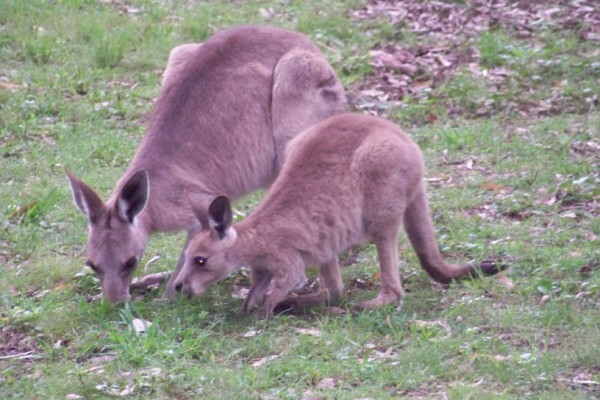 As well as looking for the aboriginal sites, time was spent contemplating nature: the wallabies and kangaroos, platypus and birds. It had been raining so the wild flowers were in abundance. The creek came up and went down again, creating opportunity to stay in camp working on different projects or reading. 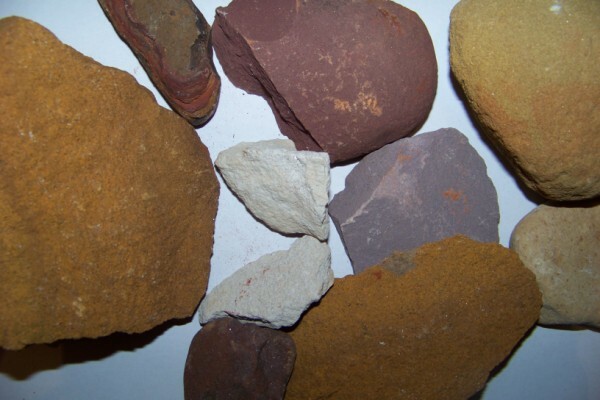 We spent time fossicking for ochres and building formations with beautifully rounded river rocks. Carnarvon Gorge is certainly a very beautiful spot. I have a cat that has come to visit for a bit. It’s my daughter’s cat and has lots of very beautiful fluff which unfortunately gets deposited everywhere. 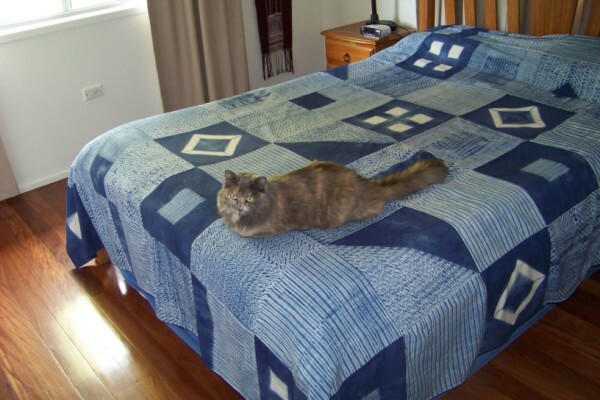 I also didn’t want cat on my beautiful Indian bedspread so decided to make an alternative. It was a great opportunity to play with some basic woven shibori. I decided to weave some lengths that would then be cut into squares and later joined. Plain weave was deemed essential. Three warps were woven, each with a basic resist threading. The aim was to achieve 3 variations of 4 squares within each warp, a total of 12 squares from each. Some variations were achieved by the resist weave pattern, others by removing sections of resist after it was woven. In addition, one warp was woven without resist and some basic clamping on folded cloth was carried out. All fabrics were prepared before dyeing in the one bath, thus ensuring that the colour was uniform. From a very restricted and simple design brief, I have ended up with quite a varied collection of squares which were then assembled in a relatively random manner. This detail is of six panels showing variations in resist pattern. All fabric is hand woven. An exhibition, the garden, studio time and adventures in Darwin are the activities this month. 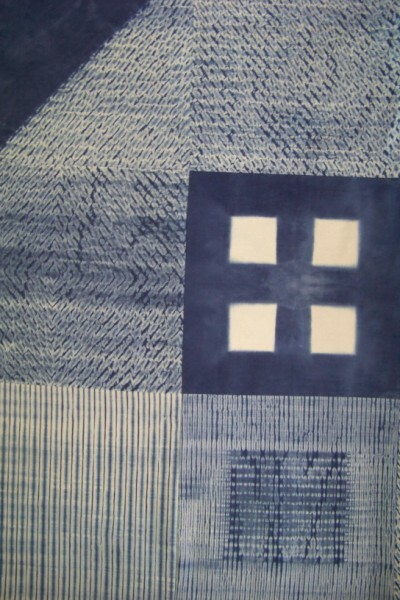 Scarf is an exhibition by the members of the World Shibori Network Australia and New Zealand. 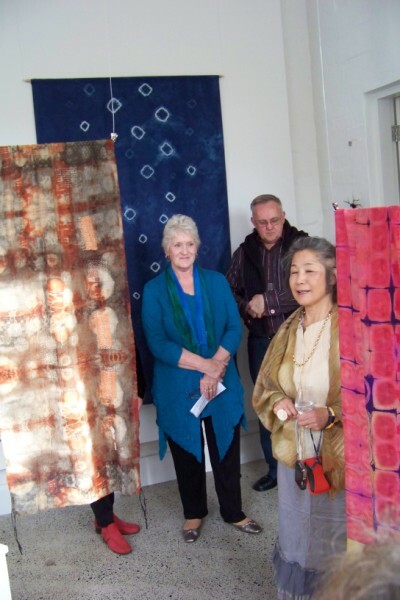 Yoshiko Wada, the acclaimed shibori expert has been in Australia conducting workshops. To coincide with her visit an exhibition was planned and opened in Barometer Gallery on 12 September. It finishes on 3rd October. After which it will tour and come to Brisbane on 6-21 November. Along with a number of other Queenslanders, Sheila Virgo and I flew to Sydney for the opening. I have spent a lot of very productive time in the studio weaving. As well as producing a quantity of pieces which are now at the stage of being “finished” prior to dyeing, I was reminded of the need to have equipment functioning at its full potential. Some of the pieces required a heavy beat. Dancing over the treadles, both feet flying, body suspended balanced over a loom while it moves is a recipe for developing some pain. Reminder: Tie the loom down. Who took my rope? It used to be there but in getting some things moved on a trailer it was removed. I have put an interim rope back on so it is now securely anchored. I am aware though that having surplus loose rope is not ideal. It will be fixed. I took time out from weaving and went to Indigiscapes. It is an initiative of Redland City Council where they grow seedlings from local native plants. I went to acquire a few additions for my garden. 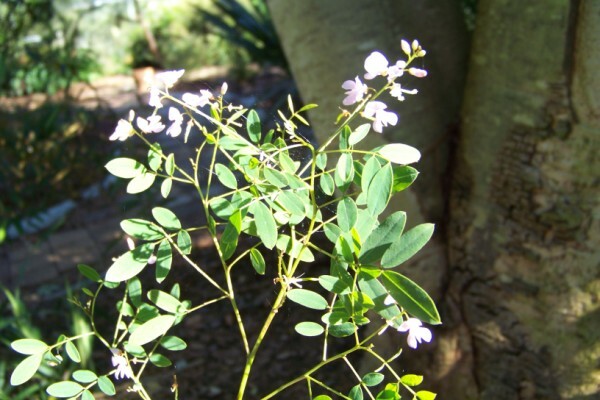 I found Indigofera australis, a native indigo. The plant is labelled “Open shrub to 1.5m with attractive heads of pink flowers. Full sun or semi shade.” The pretty flowers caught my eye, but it was the plant name that caught my imagination. Of course I’m going to try and dye with them….some time. I have acquired several. My plants are very tiny: about 40 cm high and a twig. It will take a very long time for them to produce enough leaf for a dye bath; perhaps this time next year. My daughter, Helen and I have just returned from a week’s visit to Darwin to see my son/her brother Andrew. 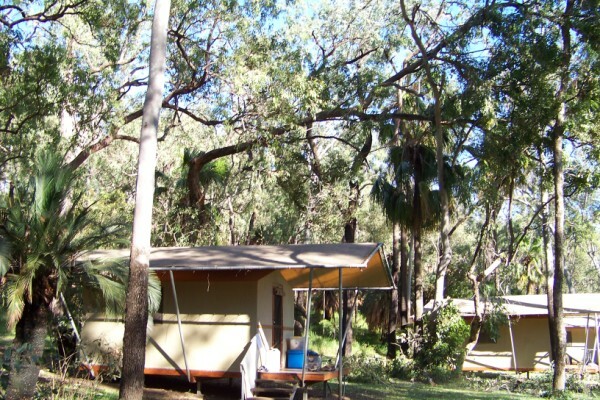 In addition Helen and I visited Kakadu. It is an amazing place and is world heritage listed both environmentally and culturally. As well as experiencing the landscape and seeing a large number of saltwater crocodiles, a huge number and variety of birds and beautiful lotus, we saw some amazing indigenous rock paintings at Ubirr, north of Jabaru. 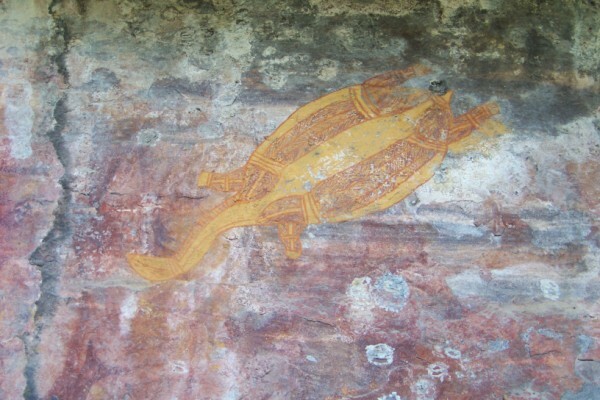 The paintings are executed in ochres and are hundreds to thousands of years old. They are remarkable in their detail with many having fine brush work in an X-ray style. There are 2 types of paintings: that done by the spirits and those by the aboriginals. There are no recent paintings being done on this site. Instead they are being painted on canvas and board for the tourist market. It is interesting that no paintings are “touched up”. This is culturally not accepted, but it is accepted for paintings to be painted over and there is much evidence of this. The act of painting is what was important. No spirit painting is ever painted over. 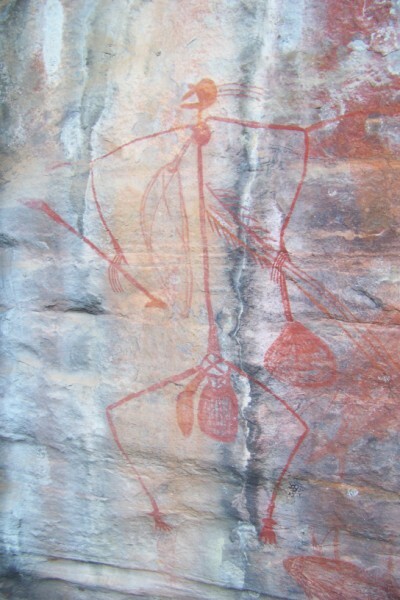 This painting of Mayubu reminds traditional owners to tell a story which warns against stealing. Creation Ancestors feature prominantly at the Ubirr rock art galleries. We timed our visit to Ubirr perfectly. Two aboriginal ladies from Kunbarllanjnja (Oenpelli), a community just west of the Kakadu boundary, demonstrated some fibre techniques. 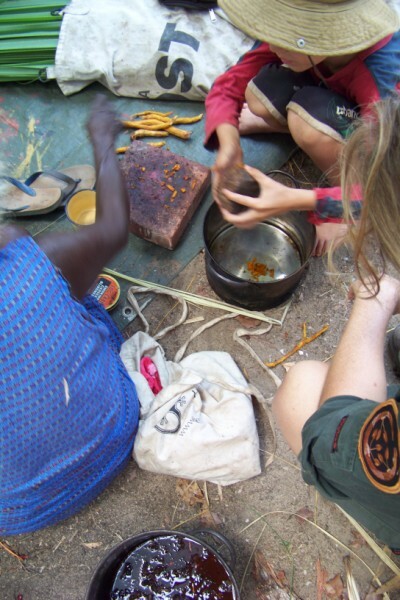 These included how to prepare fibre from pandanus leaves, dye and make baskets. We were encouraged to try to make fibre. 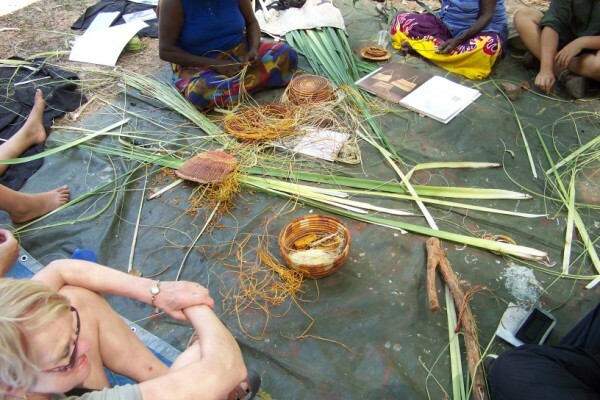 It involves splitting the pandanus leaf in half widthways and then into several long lengths. It is tricky! They make it look so easy. On their trip across they had collected a number of plants (bulbs and some flowers) and roots for dyeing. Unfortunately no names were given for the plants. 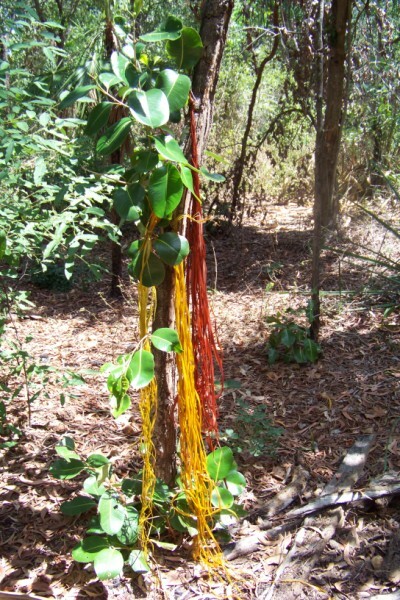 The aboriginal ladies recognise the plants and have a name for them in their language while the two rangers did not have expertise in this area. (For the Aboriginal people English is often not their primary language but rather either their second or even third language). I think that Haemodorum cocceneum was the source providing the root bulb and flower for the red/brown. It is a small plant, possibly a lily that has a bulb, long leaves and red flowers on a long stalk, growing readily in the wet season. The yellow was obtained from another root which had the bark scrapped off. In both cases the material was pounded between a paver and a rock and then put in water in a pot over an open fire. The fibre was added and the colour was extracted quickly. A coiling method was used to make the baskets. These baskets are sold both in galleries in Darwin and Kakadu and in their local community. A permit has to be organised before visiting Kunbarllanjnja in Arnhem Land. Lastly, a picture of a local. 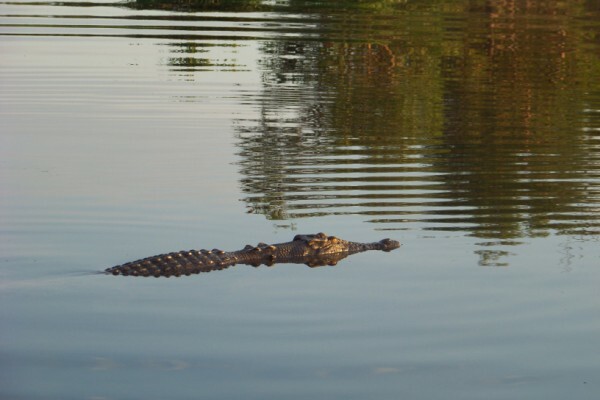 No one can visit Kakadu and not play tourist and see the crocodiles. You are currently browsing the Kay Faulkner's Blog blog archives for October, 2010.